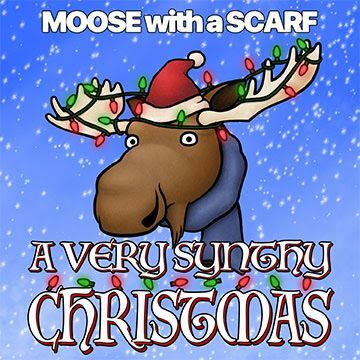 In celebration of the release of electronic music artist Moose with a Scarf’s “A Very Synthy Christmas,” Composer and Conductor Anthony Sabatino hosts an open seating party tonight, from 7:00 p.m. to 9:30 p.m., at the Scum and Villainy Cantina in Hollywood. Sabatino – the true identity of EDM artist “Moose with a Scarf” – in his more serious work also composes for film, commercials and video games where he “stylistically … focuses on scoring through the color of sounds, whether this be through orchestration or sound design,” according to press information. He’s composed for a variety of film genres, ranging from neoclassical orchestrations, chamber works, and aleatoric scoring, is a principal conductor for the Dana Farber Charity Concert, the Guitar Arias Concert, a conductor and arranger for the opening act at Japan Festival Boston 2017, founded the Berklee/Boston Conservatory Recording Orchestra, and currently runs and hosts the Film Score Bros. podcast. The album, “A Very Synthy Christmas,” released November 30, 2018, and can be found on Spotify, iTunes, Bandcamp, and other online retailers. This entry was posted in Cocktails, Beer & Wine, Events, Music and tagged A Very Synthy Christmas, Anthony Sabatino., christmas music, EDM, holidaytime, Moose with a Scarf', Scum and Villainy Cantina, star wars, Videogame soundtrack. Bookmark the permalink.